By hungry runner on March 13th, 2013 . Filed under: Cupcake Ideas, Holidays . The past few years when it’s time for St. Patrick’s Day I start seeing the McDonald’s commercials for their Shamrock Shake. 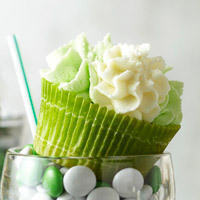 The mint flavored, bright green colored shake is the inspiration behind these shamrock milkshake cupcakes from Better Homes and Gardens. Buttermilk and creme de menthe give these cupcakes their minty milkshake flavoring.